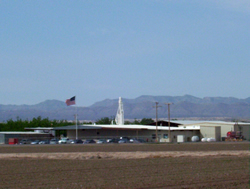 About Sun Valley Pecan Company, Inc.
Sun Valley Pecan Company is nestled in the upper Rio Grande Valley, about twenty-five miles east of El Paso, Texas. 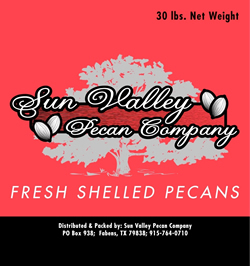 Since 2001, Sun Valley Pecan has been committed to consistently delivering its customers safe, high-quality shelled pecans. Our family’s involvement in agriculture dates back to the early 1900's. The owner and president is a 3rd generation pecan farmer, and he has been involved in the pecan industry for over 30 years. Sun Valley Pecan is kosher certified by the Orthodox Union and is registered by Silliker Global Certification Services, SQF Code Edition 7.2. It is our goal to provide unsurpassed honesty and integrity in all of our endeavors. We strive to always meet or exceed our customers’ expectations. We don’t have to be the largest, only the best! 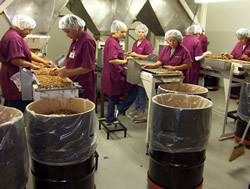 Each year, we shell millions of pounds of pecans. Whether they’re from our own 650 acre farm, or from local farmers we personally know and trust, we pride ourselves in being able to shell and package these pecans in a true state-of-the-art facility. As proud as we are of our equipment, we still include the personal touch of hand sorting and picking every pecan before packaging. Sun Valley Pecan produces every size from Fancy Mammoth halves to Fancy Small pieces, along with Choice halves, pieces and meal. Pecan harvesting usually begins in October and continues through December. The actual times depends on growing conditions during the spring and summer, and it’s not uncommon for harvest to continue into January. 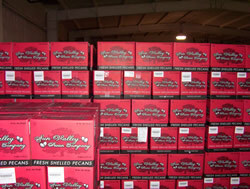 Most of our pecans are contracted January through March, and delivered during the remainder of the year. We also have spot sales available. Having both on and off-sight cold storage facilities, we are able to ensure freshness year round. With operations running 24 hours a day, 12 months a year, it’s no wonder you’ll find our delicious pecans in over 14 countries, from food service suppliers to grocery stores, ingredient users, bakeries, and restaurants.